Artis Zoo is the oldest zoo in Holland (founded in 1838), located in the centre of Amsterdam. It is open every day from 9.00 until 17.00, and the entrance fee for adults is 18,50 Euro. The zoo can be reached using tram 9, 10 or 14, or by going of on the Waterlooplein metro station. 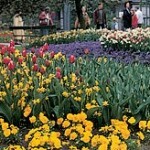 Besides the fact that many animals can be seen in Artis Zoo, visitors coming between January and May can enjoy as thousands of tulip bulbs bloom.